﻿ Fun Easy English - Travel the United States of America - Oklahoma. Learn before you travel. This section of Fun Easy English focuses on facts and other cool stuff about your favorite U.S. state. This is great English reading practice. This page focuses on the state of Oklahoma. 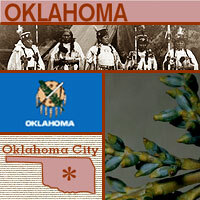 The name Oklahoma comes from two Choctaw Indian words, okla, which means "people," and humma, which means "red." In 1889, Congress opened up 2 million acres for white settlement (it was previously open only to Native Americans who were forced to leave their homelands), and the first of a number of land runs began. Some of the state's settlers were called "Sooners" because they had already staked their land claims before the land was officially opened for settlement. 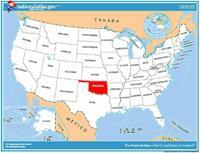 Oklahoma was admitted as the 46th state in 1907. Oklahoma's capital is an easy one to remember--Oklahoma City. The state flower is the mistletoe, a favorite for kissing under during the winter holidays. The current state flag of Oklahoma, designed by Louise Fluke, was adopted in 1925 (Oklahoma had 13 previous flags). Origin of Name Based on Choctaw Indian words: "okla" meaning people and "humma" meaning red." Travel and tourism site for Oklahoma - This state travel and territorial tourism site provides ideas for your vacations, meetings, and more. Every year in August hundreds of Native American people from all different tribes come to the city of Anadarko, Oklahoma. Named after a Plains Indian tribe, Anadarko is now the home of one of the largest gatherings of Plains Indians in Oklahoma. Because so many Plains Indian populations have lived in Anadarko, it is known as the "Indian Capital of the Nation." This gathering of Native Americans is called the American Indian Exposition. An exposition is a public exhibition or show. The purpose of this exposition is to show off Native American arts and crafts and help preserve their cultural heritage. The Native Americans who attend sometimes camp out in traditional teepees and they may wear traditional leather clothing, called buckskin. Lots of people who are not Native Americans come to observe Indian culture; they watch the parades or greyhound and horse racing, or they attend one of the many dances or contests that are held. Several months before the exposition, each tribe selects a tribal princess who will represent them for a year. A tribal princess is smart and strong. She must also possess a fine personality, be self-confident, and have other qualities that make her a leader. During the exposition, the princesses have the honor of leading their tribes in the parades that begin and end the festivities. Did you know there was once a desert in Oklahoma called the Dust Bowl? During the great dust storms of the 1930s in Oklahoma, the weather threw up so much dirt that, at times, there was zero visibility and everything was covered in dirt. No matter how tightly Oklahomans sealed their homes, they could not keep the dirt from entering. Dust storms were the result of drought and land that had been overused. Drought first hit the country in 1930. By 1934, it had turned the Great Plains into a desert that came to be known as the Dust Bowl. In Oklahoma, the Panhandle area was hit hardest by the drought. The land of the southern plains, including Oklahoma, was originally covered with grasses that held the fine soil in place. Settlers brought their traditional farming techniques with them when they homesteaded the area and they plowed the land deeply. The topsoil was already damaged by the overgrazing of cattle and sheep. The situation was so serious that, by 1935, the government developed conservation programs to improve the Dust Bowl by changing the basic farming methods of the region. Even with these measures, the Dust Bowl lasted about a decade and contributed to the length of the Great Depression of the 1930s. How did someone named Gordon Lillie come to be called Pawnee Bill? While Pawnee Bill was performing in Buffalo Bill's Wild West Show, he met a woman named May Manning. Soon after they met, May married Pawnee Bill and became May Manning Lillie. Then the couple started their own Wild West show, with May as one of its star performers. Pawnee Bill's Wild West Show was so popular that today it is still re-created at Pawnee Bill's Buffalo Ranch in the town of Pawnee, Oklahoma, for thousands of people to enjoy. Why would a museum be dedicated to a highway? Because Route 66 is no ordinary highway. Route 66 was built in 1932 and it runs from Chicago, Illinois, to Los Angeles, California, then known as the "Promised Land." That's 2,400 miles of road! It is different from most other highways because it takes a diagonal course instead of going in a straight line. It was designed this way so that small towns would have access to main roads, giving farmers the ability to transport grain and produce. This two-lane road passes through eight states and three time zones. During the Great Depression, Route 66 was the road from Oklahoma and the Dust Bowl to California and a better life, so it became known as the "road to opportunity." Author John Steinbeck wrote about Route 66 in his classic The Grapes of Wrath, calling it the "Mother Road." The Route 66 Museum was built in Clinton, Oklahoma, because Route 66 passes through 400 miles of Oklahoma. Dozens of artists have recorded the song "(Get Your Kicks on) Route 66." Have you ever heard it? Have you ever eaten a kolache? The most popular food from Czechoslovakia is a pastry called a kolache (pronounced koh-lah-chuh). A kolache is a delicious, small bun usually filled with fruit or cheese. In the Czech Republic and Slovakia, no wedding feast is complete without them. One woman, Maria Fiala, baked 600 dozen kolache for the festival and was named Kolache Queen. The Czech Festival is a way for the people in Yukon with Czech and Slovak backgrounds to preserve and share their Czech customs, clothing, and foods. One of the main attractions of the festival is dancing. Lots of dance performances are held, and people of all ages, like these kids in the beautiful costumes, are encouraged to join in. If you aren't Czech or Slovak, the festival is a great way to learn about their customs. Have you ever heard of the Battle of Washita? You can learn about this famous battle at the Washita Battlefield National Historic Site in Oklahoma. This site is important because it helps us remember the violent conflict between Indians of the Great Plains and the United States Army. The Great Plains include the land from the Canadian border south to the New Mexico and Texas borders, and from the Missouri River west to the Rocky Mountains. The Indian tribes from this area -- the Plains Indians -- include the Cheyenne, Arapaho, and Kiowa. The Army fought these tribes because they wanted to gain control over the Great Plains. For many years before and after the Civil War, the U.S. government tried to move Indians to an Indian Territory (present-day Oklahoma). Some Plains Indians agreed to move to reservations but others, like the Cheyennes, Kiowas, and Comanches, did not. Instead, they continued to live and hunt on traditional lands outside the Indian Territory. After the Civil War, settlers wanted to move into this land, so they attacked. At dawn on November 27, 1868, Lieutenant Colonel George Custer attacked a sleeping Cheyenne village in the Washita Valley, surprising the Cheyenne's leader, Chief Black Kettle. Many Plains Indians were captured or killed during this battle. Chief Magpie, a teenager at the time who lived in Black Kettle's village, shot a soldier and took his horse, then rode off to safety. He lived to fight Custer again at the famous Battle of Little Bighorn in 1876. The following is a description of national forests in the state of Oklahoma. There are no national parks or monuments in this state. If you plan to visit or live in Oklahoma for awhile then you should definitely plan to visit some of these fantastic places. Including the namesake Ouachita Mountains, this forest has nearly 800,000 acres (320,000 ha) of old-growth forest. The forest has two wilderness areas: Black Fork Mountain and Upper Kiamichi River. This national forest is also partially located in the state of Arkansas.